Participants will learn the basics of IPT for groups and be fully equipped to conduct IPT for groups at the end of the course. IPT for Groups is now approved by Los Angeles County DMH for Prevention and Early Intervention. IPT for Groups is open to all interested clinicians who have completed IPT Level A Training. All participants will receive an IPT for Groups certificate upon completion of the course. Course enrolment is limited to 20 people– please register early. Bring a co-therapist and SAVE! 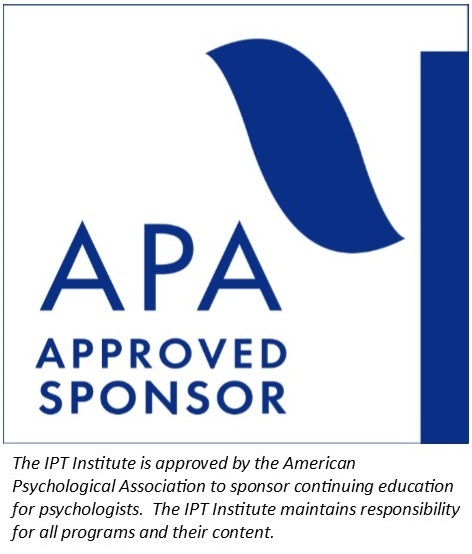 The IPT Institute is approved by the American Psychological Association to sponsor continuing education for psychologists. The IPT Institute maintains responsibility for this program and its content. This CE Course is targeted towards all interested clinicians at any level of training. The instructional level is introductory. It is recommended that participants complete Level A Training in IPT prior to taking this course. 14) Describe the options for group IPT facilitation. A $100 charge will be applied for all cancellations. Refunds (less $100) will be made until January 1, 2019. 13 CE credits are offered for this training. No partial credit will be given. All educational activities at this training will offer CE credit. There is no commercial support for this CE Program. There are no conflicts of interest for the instructor for this CE Program. For information about the CE grievance procedure, please click the link below.